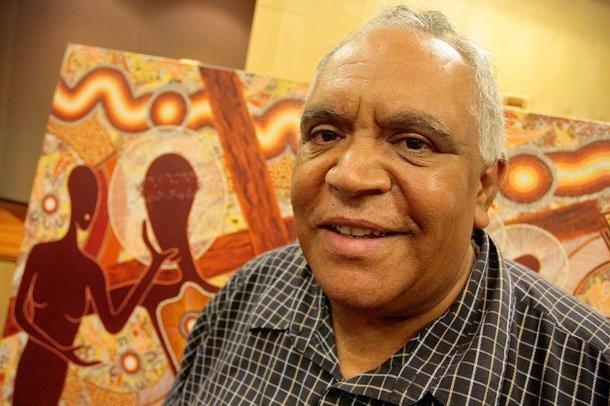 WYD08 is using the art of renowned Aboriginal artist Richard Campbell to convey the message of Aboriginal Catholic spirituality to the pilgrims. Nineteen of Richard’s works are being used as images on WYD08 merchandise, including t-shirts, key rings, magnets and cards. “It is important to let people around the world know that there was a religion of spirituality in Australia before we were colonised by white people,” Campbell believes. Richard Campbell was born into the Dhungutti tribe, near Bowraville on the North Coast of NSW, in 1956. As a child, he would sketch pictures for his dad, who would burn them into shields, spears and boomerangs and sell them for food. After a tumultuous childhood, during which Campbell was removed from his family and taken to foster-care, he began painting again. It was then he realised his gift. Through painting, he felt his own spirituality come flooding back to him. He began to remember the stories of his people, noticing the similarity between Aboriginal stories and stories of the bible. Campbell is working at the Australian Museum in College Street during WYD week celebrations. He is offering painting demonstrations and talks to anyone who is interested in the connections between Aboriginal spirituality and the bible. ProjectEye is a content partner for SBS providing critical news coverage of WYD08 from a youth perspective.